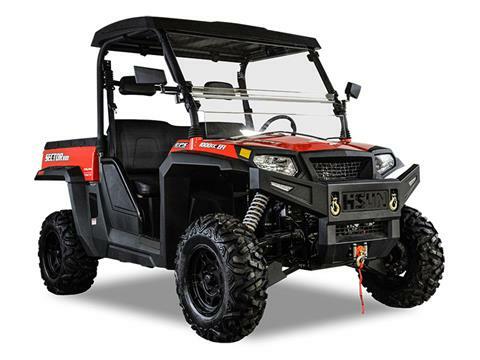 The powerhouse of the Sector line the Sector 1000 offers four-wheel drive with locking differentials, Dual A-Arm Suspension with Nitrogen Assisted Shocks, EPS steering, a power assisted 1000 lb. cargo bed, and a 4500 lb. winch. The Sector 1000 is the perfect combination of power, accessories, and features to get the job done. The standard 2-year warranty will give you the confidence you need to push it to the limit. Empty Vehicle - 1,764 lb. Gross Vehicle - 2,554 lb.